Yesterday, June 28th, marked 100 years since the assassination of Archduke Franz Ferdinand of Austria and his wife in Sarajevo. The event triggered the start of World War I. On this occasion, I wanted to read the Wikipedia article about the assassination to be refreshed the sequence of events. After learning that the first assassination attempt had been unsuccessful, Princip thought about a position to assassinate the Archduke on his return journey, and decided to move to a position in front of a nearby food shop (Schiller’s delicatessen), near the Latin Bridge. At this point the Archdukes’ motorcade turned off the Appel Quay, mistakenly following the original route which would have taken them to the National Museum. Governor Potiorek, who was sharing the second vehicle with the Imperial couple, called out to the driver to reverse and take the Quay to the hospital. Driver Lojka stopped the car close to where Princip was standing, prior to backing up. The latter stepped forward and fired two shots from a distance of about one and a half metres (5 feet) using a Belgian-made 9×17mm (.380 ACP) Fabrique Nationale model 1910 semi-automatic pistol. Gavrilo Princip was the Bosnian Serb who fired the gun in this conspiracy. He was sentenced to 20 years imprisonment together with many other conspirators, some of which were sentenced to death. The house where Princip lived could be visited as part of a museum for some time but in the subsequent war was destroyed. The ground from which Princip fired had some steps as memory, but they were also destroyed in the 90s. Today, there is only a plaque in the wall in the place from which Princip shot the archduke death. We visited the place back in the summer of 2007. I wanted to share 2 pictures from those iconic places. Plaque at the point from which Gavrilo Princip shot Franz Ferdinand. 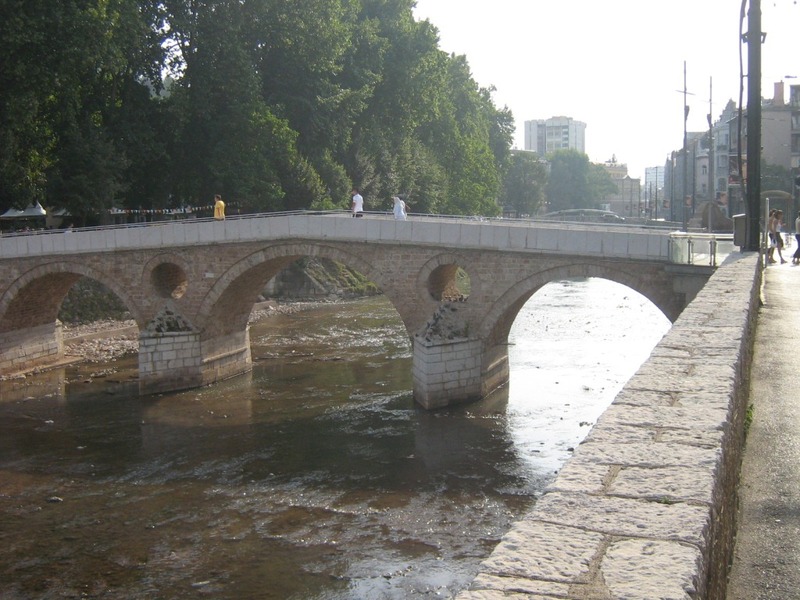 Sarajevo is a wonderful city despite of having been devastated by so many wars. However, at the time we visited the place, there was not much to see in relation to this historic event. Nevertheless, in different museums the different pieces of the story can be seen: the car and the gun can in Vienna, the bullet, in Czech Republic.